Earl Miller is an independent art writer and curator residing in Toronto. He has curated exhibitions at Galerie Vermelho in Brazil, the Doris McCarthy Gallery in Toronto, the Art Gallery of York University, the Kenderdine Art Gallery in Saskatoon, the Yukon Art Centre in Whitehorse, and the Dorsky Gallery Curatorial Progams in New York. 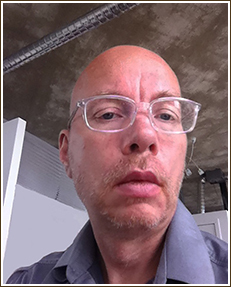 He has written for art periodicals such as Art in America, C Magazine, Canadian Art, Art in America, and Flash Art as well as online publications including Momus. He has written catalogue essays for museums and galleries including the National Museum of Art of Romania, CREDAC in Paris, the Robert McLaughlin Gallery in Oshawa, The Art Gallery of Hamilton, and Mercer Union in Toronto. He has contributed to books including Gordon Monahan: Seeing Sound and The Communism of Forms. He is an executive member of The International Association of Art Critics (Canada). Earl would like to acknowledge the Ontario Arts Council Writers' Reserve grant program.